Introducing the Bergamo 40, Orbita's new "disappearing" watchwinder. Watch collectors now have a choice. They can keep up to 40 automatic watches fully wound, either on display or completely hidden from view. 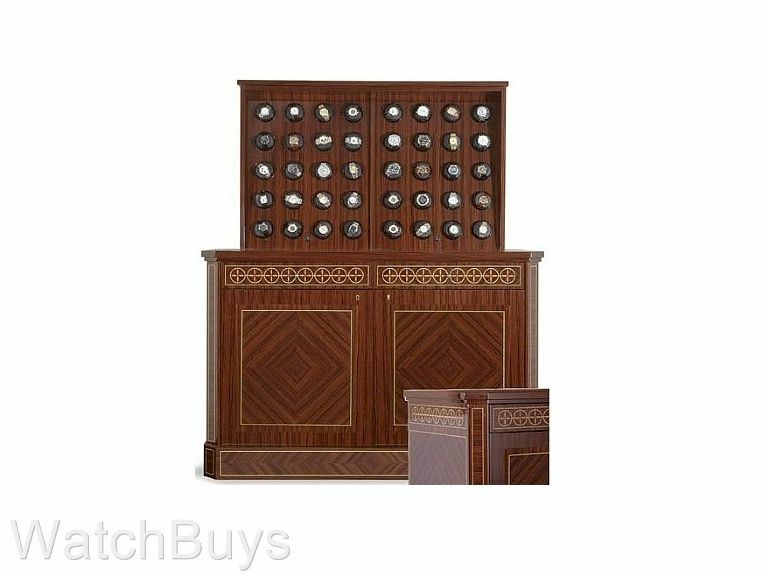 The attractive Italian-made inlaid and veneered cabinet houses a remote controlled motorized lift mechanism that raises or lowers the watchwinder module on command. A keyed security lock is also provided to prevent the winder from being accessed by unauthorized persons. 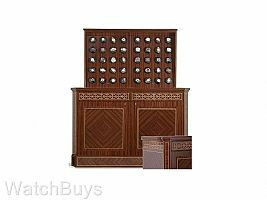 When in the lowered position, both the watches and the watchwinder mechanism are totally concealed and the casual observer only sees a beautifully detailed piece of furniture. Even when the front doors are opened, while the storage area is exposed there is no hint of the watches stored behind as they are concealed behind a false mirrored panel. Two waist-level, ball-bearing mounted storage drawers are also provided for paperwork and personal items. The Italian-made cabinet is available in madrona burl, mahogany parquet or rosewood veneers with decorative inlays of brass and pear wood. Access to all internal mechanisms is from the front of the cabinet. Forty (40) Swiss-designed ironless core motors power the 40 winding stations. Unlike other watchwinder manufacturers who utilize a single motor to drive two, three or even four watches together, Orbita winders are built with each drive station being fitted with its own motor and controlled by its own microprocessor. Consequently, each watch station can be individually programmed for the winding requirements of a specific watch with specific settings for turns per day, winding direction and auto reversing ( if required ). On the Bergamo 40 each station is easily programmed from the front of the cabinet by simply removing a mounting cup and setting the 4 pole DIP switch mounted behind it. Also easily accessible is an on/off control switch for each individual station. The electrically powered lift mechanism has been designed to provide long, trouble-free operation. The lift action can be actuated with a wireless remote transmitter or by an easily accessible manual switch. Locking the remote control in the storage areaThe front door locks disable the lift while power is maintained to the winder motors. This feature prevents passersby from operating the unit without permission. A hinged arrangement on the top panels of the winder provides safety "breakaway" protection in the event that "inquisitive fingers" are not withdrawn as the lift unit descends into the closed position. Owners of fine automatic watches can be confident that their watches will remain fully wound, ready to wear and properly "exercised" without any concerns about over-winding. The Bergamo 40 is available with either solid wood doors or wood door panels with glass panels as desired. Standard warranty is for two years. All of the operating components are "plug and play" and in the unlikely event of component failure, each and every component is easily replaced in the field with nothing more than a screwdriver. Call us at (888) 333-4895 to order this winder so that we may note your preferences for the cabinet wood and design.